Often the staff will not know about "GiftPay" or "Flexi eGift Cards". Remember, after you have chosen, the card/voucher you have was issued by that store. For example, if you have a Best Buy eGift Card, don't try to ask the Best Buy staff about GiftPay. Just say you have a Best Buy eGift Card to use. Initially, your Flexi eGift Card will have a very long validity period, typically 5 years (although in some cases your particular eGift Card might have validity as short as 6 months). Check the expiry date shown on the main Flexi eGift Card page. 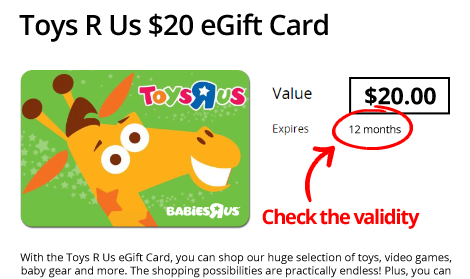 As an example, after selecting this Toys R Us eGift Card shown below, you would have 12 months to activate it before it expired, not the original 5 years of the Flexi eGift Card. For this reason it is very important to pay attention to the expiry and validity periods shown.